Could Lionel Messi have gone to Arsenal? ARSENE WENGER HAS revealed Arsenal were close to signing Lionel Messi but says the Argentine wanted to stay at Barcelona. The Gunners were in the running to sign Messi from Barcelona’s academy in 2003 when the forward was 16 and had not yet made his first-team debut for the Spanish club. Arsenal did manage to secure Cesc Fabregas from Barcelona in September 2003 but Messi joins Paul Pogba, Eden Hazard, Zlatan Ibrahimovic and Yaya Toure on the list of players who were reportedly close to a move to north London. Elsewhere, Wenger revealed that Theo Walcott will miss Arsenal’s game with Manchester United while Danny Welbeck is a doubt to face his former club. “His fitness will depend on the medical assessment this morning,” Wenger told reporters. Email “Arsenal nearly signed Messi, admits Wenger”. 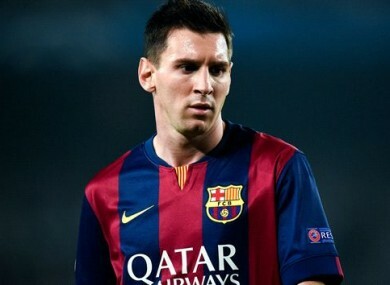 Feedback on “Arsenal nearly signed Messi, admits Wenger”.